i seriously have no clue where march went. we have been traveling a lot and have had so much on our plates during the last several weeks, i feel like it came and went before we knew it. because of all of the traveling i confess i haven’t cooked much at all lately, making me miss time in the kitchen both on my own and with the little she. during those months when we are stuck inside so much because of the cold outside, we often find ourselves making smoothies to go with nearly every lunch, the kind that are super thick and creamy. this one was our favorite of all our new concoctions this year, and pretty good for you too. dates have high levels of folate and vitamin A, while almond butter is rich in antioxidants and heart-healthy monounsaturated fats. if you have a high-speed blender, like a blend-tec or vitamix, A} i am super jealous of you, and B} they’re perfect for this smoothie because of the chopped dates. if you are able to completely puree them, all the better. if you don’t have a high-speed blender, you’ll have little bits of dates in the bottom of your smoothie, which i still kind of love. 1. blend all ingredients completely in a blender, until ice and dates are completely blended. 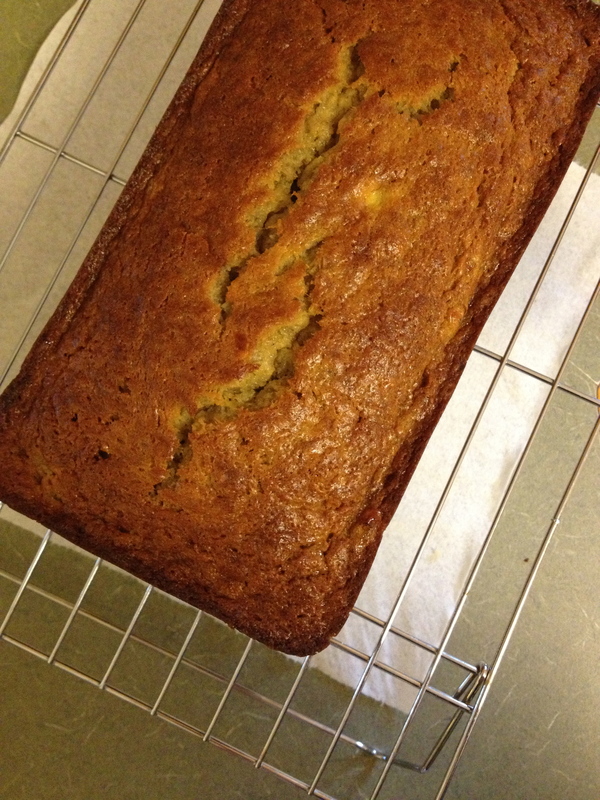 this past summer i posted a lovely spiced banana bread recipe – it is a fantastic recipe, very different from your everyday banana bread, with ginger and other spices to change it up a little. the rebel in me (and my mouth) loves that! now i want to introduce another banana bread recipe.. it is more of a traditional banana bread, and i adore it because it’s the exact kind i crave when i want banana bread. it’s super moist (yeah, i said it) since each loaf is packed with 4 whole mashed bananas. this recipe calls for no other spices, which i think makes this banana bread stand out because of it’s simplicity – the banana flavor really takes center stage. and i love the pretty cracks on the top. when i take it out of the oven and it’s so pretty, i feel a real sense of empowerment that day, like i could climb everest or solve a really hard algebra problem. 1. preheat oven to 350. butter a loaf pan generously & set aside. 2. in a medium-sized bowl, whisk the flour, baking soda, and salt. in another large bowl, cream butter and sugar with a stand or hand mixer, until light & fluffy. 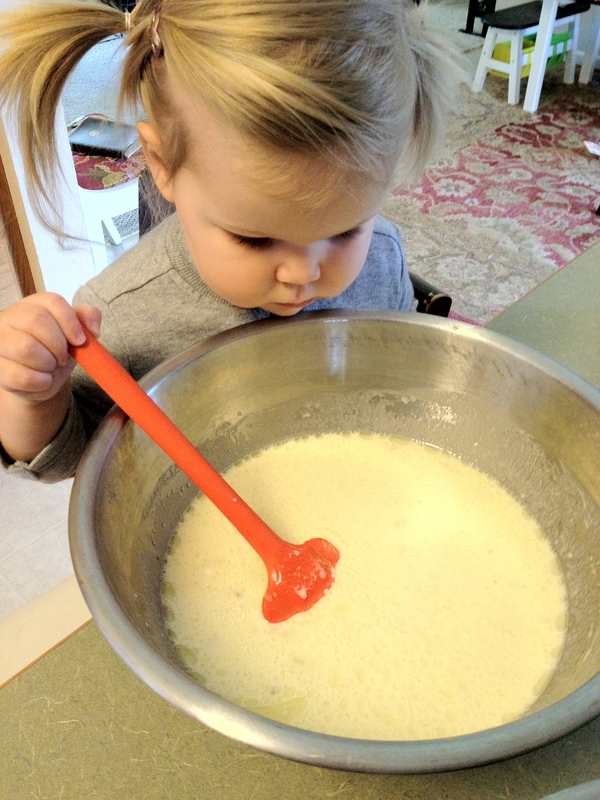 with the mixer on low, add the eggs one at a time, beating for about 10-15 seconds after each addition. add the vanilla, buttermilk, and bananas. 3. add the flour mixture and mix until just combined. pour the batter into prepared loaf pan. 4. bake for about 1 hour, until a toothpick inserted into the center of the loaf comes out clean. turn loaf out onto cooling rack and let cool. you know when you go to a restaurant and they have a house wine? or a house sourdough bread? those places have found the best, their favorite variation or recipe that they have adopted as their “house” drink, or their “house” bread. well, i want to start sharing my “house” recipes – basic recipes that are staples in my kitchen and in most people’s kitchens. it will be a new category you will find as you scroll down, on the right. it will include my whipped cream, these blueberry muffins, and coming soon, a chocolate chip cookie recipe that will make you kick off your shoes and do the bernie (my favorite old school dance move, in case you were looking for some random trivia on she likes to eat). so for my first house recipe, i give you homemade banana bread. i tried these out first as muffins and wasn’t that crazy about them, but when i made them in the classic bread, i LERVED it. it’s simple in its ingredients and the addition of the ginger adds such a delicious touch. OH and it’s a one-bowl wonder.. meaning my husband jumps for joy when he sees i have made banana bread because it means less dishes for him to do. thanks to a sweet friend of mine that brought me 6 overripe bananas, knowing that i would be able to get some use out of them, i got to make it a few times to get it just right. 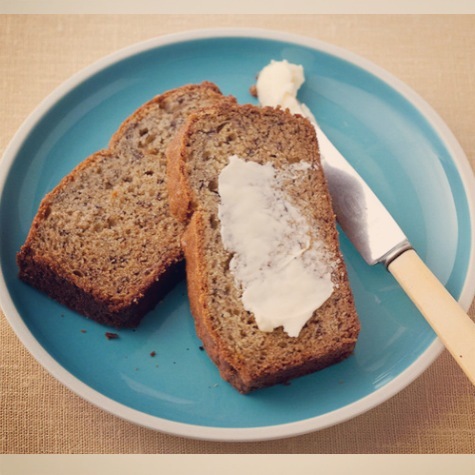 this is my favorite banana bread recipe and i hope it becomes yours too. 1. preheat the oven to 325. generously grease a loaf pan with butter, preferably, or non-stick spray. 2. beat eggs and sugar in a large bowl until well incorporated. with a spatula or wooden spoon, mix in mashed banana. add the flour, baking powder, baking soda, cinnamon, and ginger and mix thoroughly with a spatula until well incorporated. pour in melted butter and mix well. in my humble opinion, for breakfast or brunch you really can’t beat a good coffee cake. 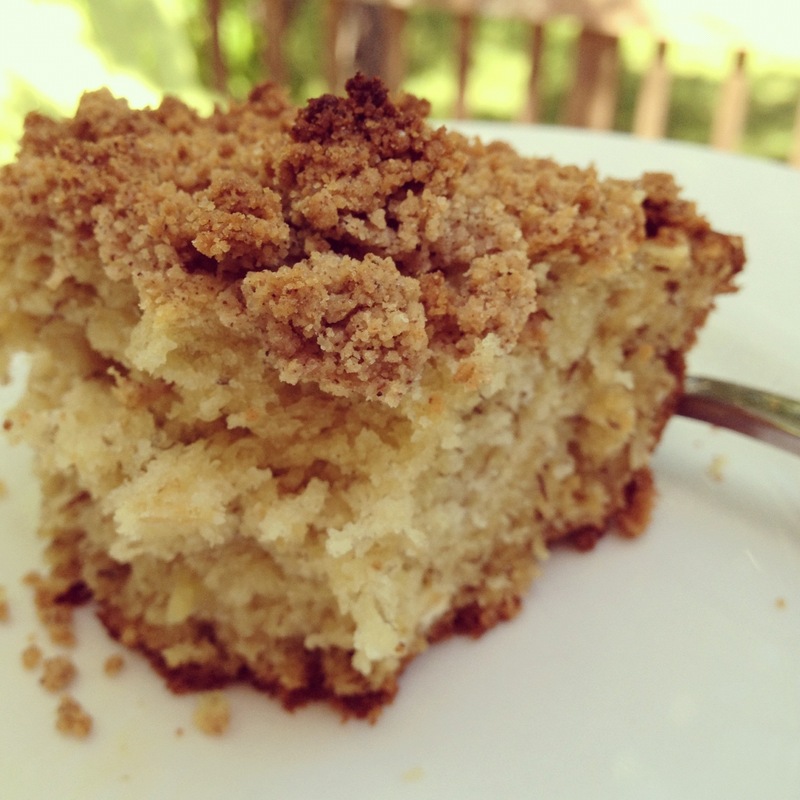 i grew up going to a summer camp that served the most amazing coffee cake every sunday. ever since i have been in love with and searching for the perfect coffee cake. recently, i had a random thought that coffee cake with bananas would be THE most perfect thing that day. so i scoured a few places to find a little assistance, and LO i have created a glorious coffee cake WITH bananas (the crowd wildly cheers). i tested it out on one of my besties and her little one, totaling 2 big kids and 2 toddlers who loved it. victory. 2. to make the coffee cake: in a large bowl of a stand mixer or using a hand mixer, cream butter and sugars together until fluffy. add in the eggs & vanilla. beat in the mashed bananas, flour, oatmeal, baking soda, baking powder, and sour milk. 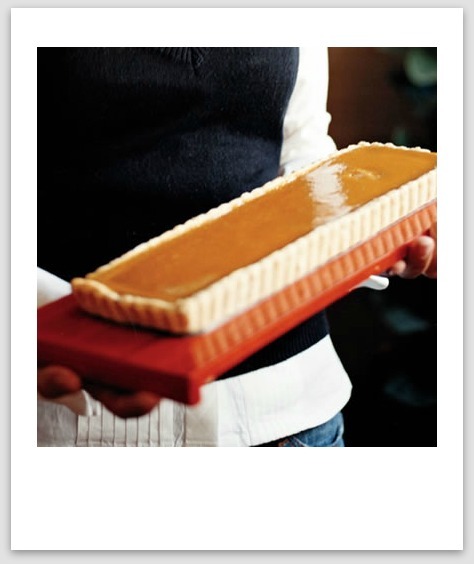 pour into a greased 10 inch square pan or pie dish. 3. to make the streusel: in a medium-sized bowl, combine 4 tbsp butter, both sugars, cinnamon, and salt with a large fork. then add in the flour and mix with your fingers until crumbly. 4. top the cake with the streusel topping and bake for 30-45 minutes, or until a knife inserted in the center comes out clean. it’s saturday, so i figured i’d post about everyone’s favorite weekend morning breakfast… PANCAKES. there isn’t always time to make them on weekdays and we’ve kind of made it a saturday morning tradition around our house. this morning was the first time the little she helped me make them. i pulled up a chair for her to stand on and she helped me mash the bananas and stir the batter. i have now hopefully started her own little obsession with The Spatula. just like mommy. 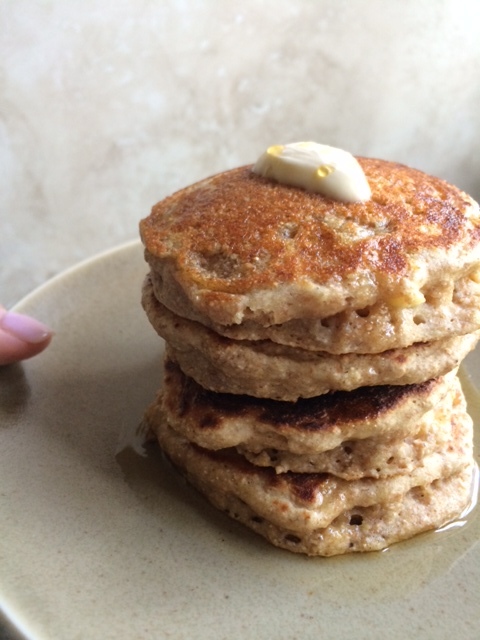 not only are these pancakes the fluffiest i have ever made, they are also healthy. 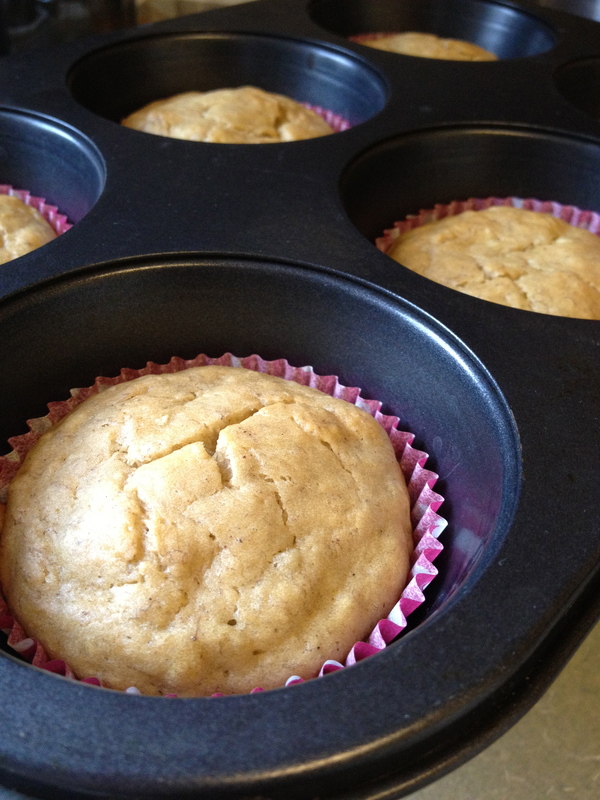 they’re made with whole wheat flour, ground flaxseed, honey, yogurt… lotso good stuff. 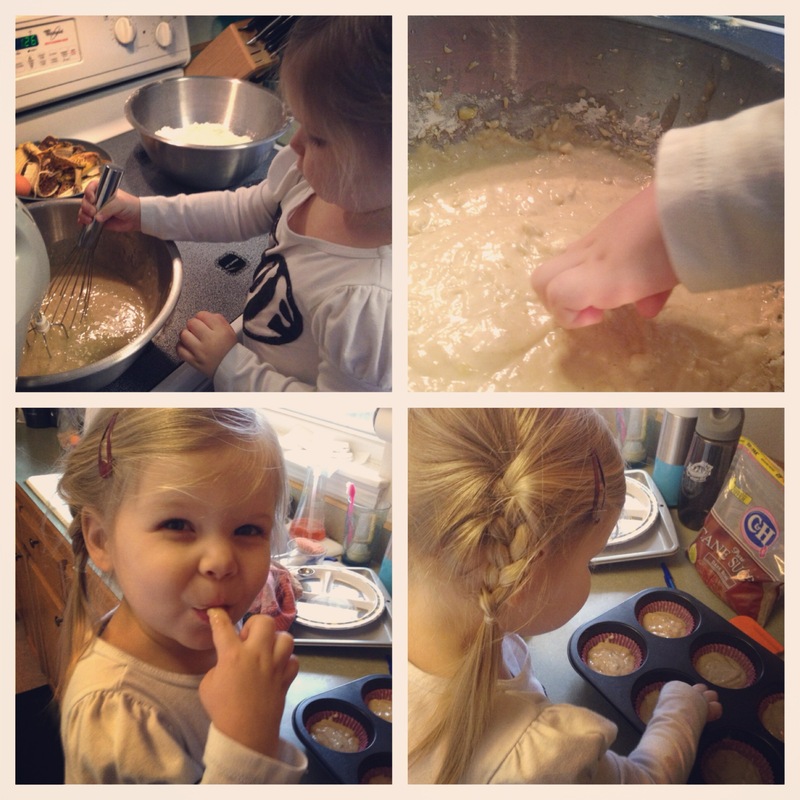 it’s so great to be able to give these delicious pancakes to my family (as the little she chants “pancakes! pancakes!”) and know that they are good for her. note: this recipe makes a lot of pancakes, so i finished off all of the batter and froze the leftovers. see below for instructions. 1. if you’re using oats and not oat flour, put the oats into a food processor and process until the mixture is very fine. in a large bowl, whisk together the dry ingredients: flour, ground oats, flaxseed, baking powder, baking soda, cinnamon, and salt. set aside. 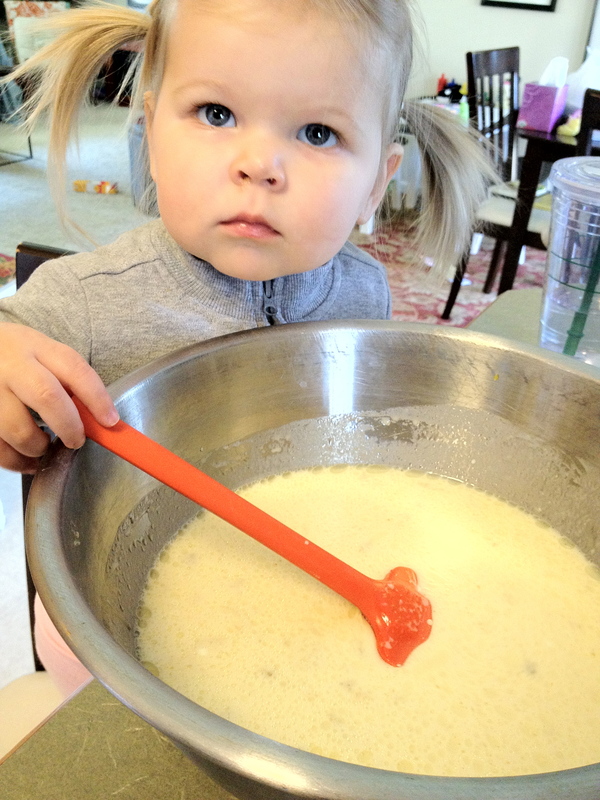 2. in a second large bowl, combine the milk, yogurt, oil, honey, mashed bananas, and eggs. hand whisk until thoroughly combined, but do not beat. 3. make a well in the center of the dry ingredients. pour the liquid ingredients into the dry ingredients and stir until well incorporated. again, do not beat mixture. just stir until moist & combined. 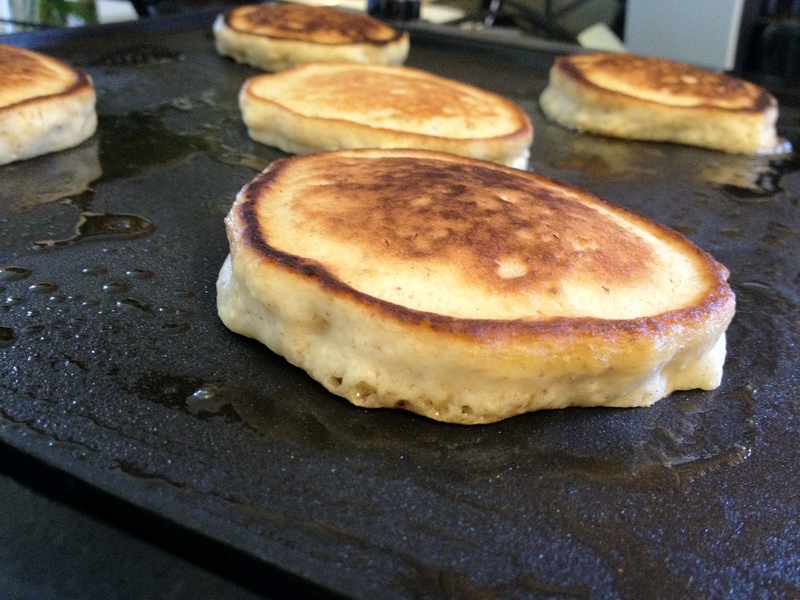 4. turn your griddle or pan up to medium-low. grease with cooking spray, oil or butter (the flavor that the butter adds is amazing & it makes the edges a little crispy) – this is key, otherwise the pancakes will blacken on the outside. add batter to the griddle using a 1/4 cup scoops (don’t make them too big or they can blacken easier). cook until they are browning on the bottom and the tops have just begun to bubble before flipping. 5. pancakes can be kept warm in a 150 degree oven on a cookie sheet while you are making the rest. serve with your favorite maple syrup or honey (but these pancakes are so gloriously delicious, i think they can be eaten with no syrup at all). cool completely. place pancakes in freezer bags (i like to use the freezer press-n-seal wrap) in twos. to reheat, warm in a toaster, toaster oven, or microwave. this recipe is one of my favorite holiday desserts. it’s a play on the original sweet potato pie, but with a twist. 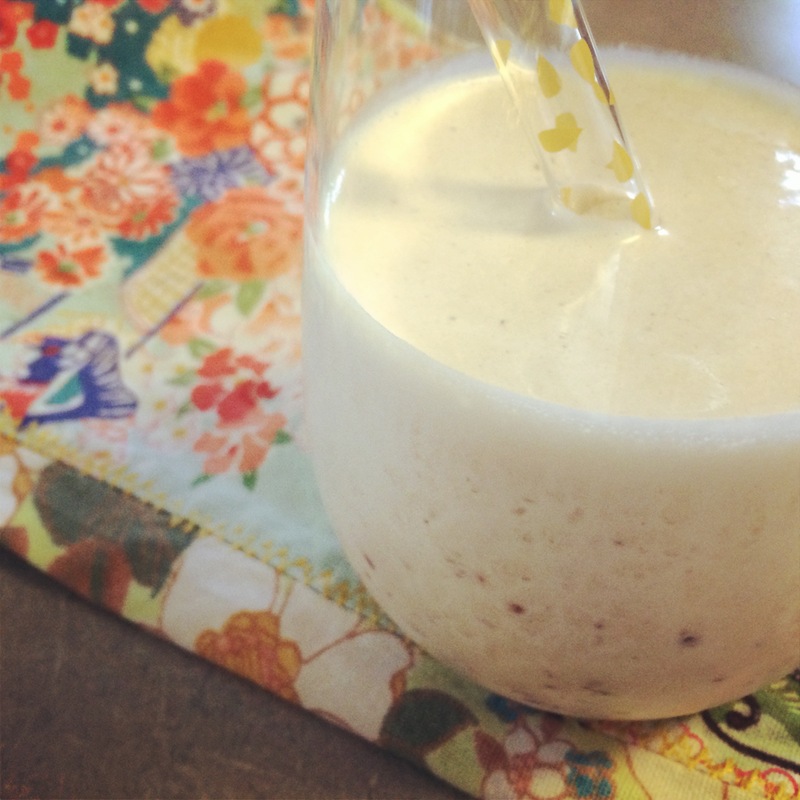 it has mashed bananas in it, giving it a sweet second dimension and creamy texture. the recipe was created by a chef’s wife, who likes to serve it with a scoop of vanilla ice cream (if you’re asking me, use blue bell homemade vanilla), a sprinkle of crumbled shortbread cookies and a drizzle of maple syrup. YUM. 2. meanwhile, in a medium saucepan, cover the sweet potato slices with water and bring to a boil. cook until tender, about 15 minutes. strain and mash until smooth. transfer one cup to a bowl. 3. in a small, nonstick skillet, cook the sliced banana with the dark brown sugar over medium heat, turning once, until caramelized, about 5 minutes. mash the banana into the sweet potato, then stir in the eggs, cream, raw sugar, light brown sugar, pumpkin pie spice and salt. 4. pour the mixture into the pre-baked tart shell and bake until slightly puffed and set, about 35 minutes. let cool on a rack, or refrigerate overnight.